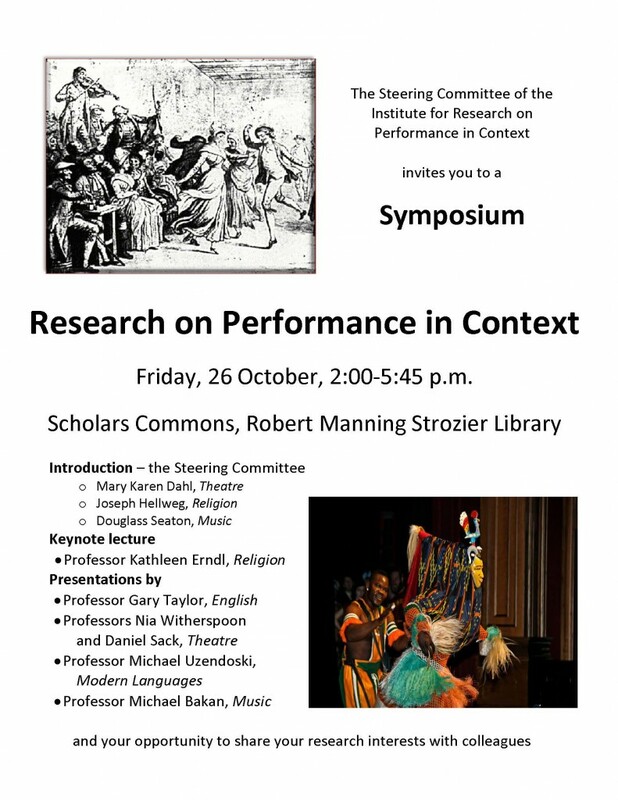 The Steering Committee for the FSU Institute for Research on Performance in Context will host a Symposium on Friday afternoon, 26 October, for all faculty and student scholars who share an interdisciplinary interest in this broadly interpreted area. The event will take place in the Scholars Commons in the basement level of Strozier Library at 2:30-5:45. It will include several faculty presentations but also informal time for everyone to share their own interests with their colleagues. Light refreshments will be provided. We hope that you will help us out by posting the flyer where interested faculty and students will see it, and by circulating it via email to the members of your department. Of course, we will hope to see you at the Symposium, too!